This Baetis nymph is quite a bit larger than any of the others I found in winter 2004. Abdomen segment 5 is only slightly pale while 9 and 10 are quite pale. The tail is banded at the tip. Its body measures about 9mm long. It's much larger than the other Baetis specimens I collected, and it has quite well-developed wingpads. It's most likely a mature nymph from a very early-hatching brood. It comes from the headwaters of a very small, very spring-fed Lake Superior tributary, which wasn't at all frozen despite very frigid temperatures and 3 feet of snow on the ground. 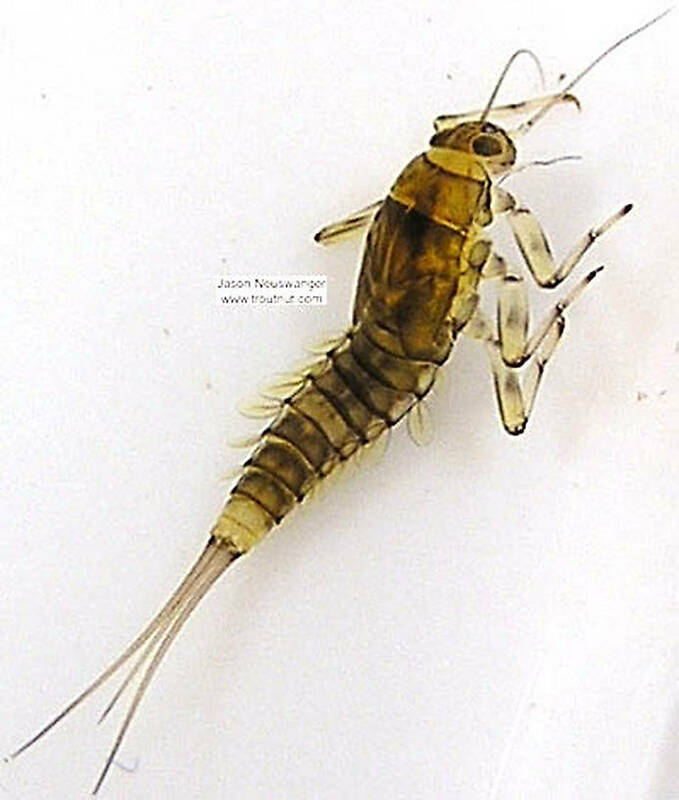 This mayfly was collected from Schacte Creek, Bayfield County on February 5th, 2004 and added to Troutnut.com on January 25th, 2006.